68 • July 2018 • S I G N & D I G I T A L G R A P H I C S ARCHITECTURAL AND ENVIRONMENTAL A curved wall sign for the south complex of a medical office building. 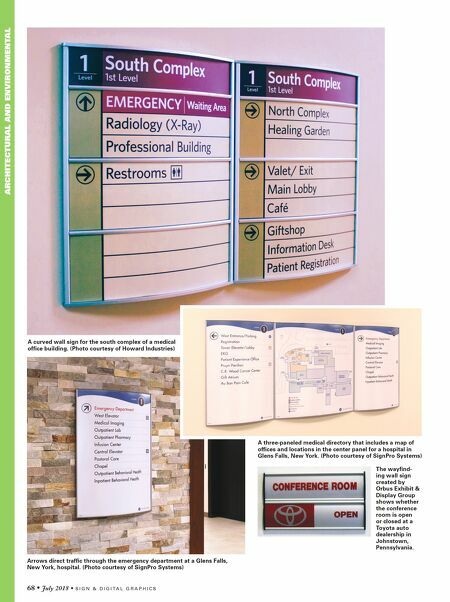 (Photo courtesy of Howard Industries) A three-paneled medical directory that includes a map of offices and locations in the center panel for a hospital in Glens Falls, New York. (Photo courtesy of SignPro Systems) Arrows direct traffic through the emergency department at a Glens Falls, New York, hospital. 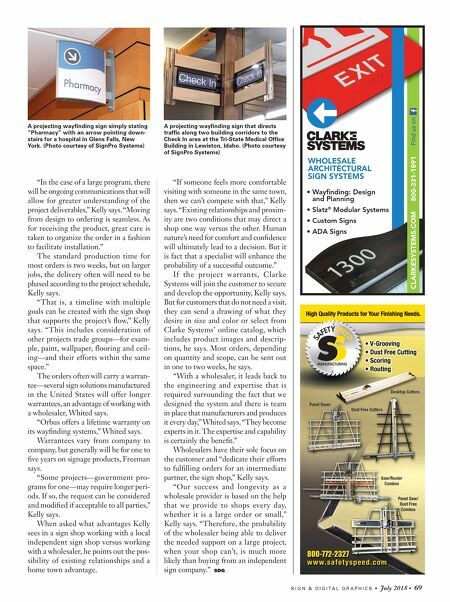 (Photo courtesy of SignPro Systems) The wayfind- ing wall sign created by Orbus Exhibit & Display Group shows whether the conference room is open or closed at a Toyota auto dealership in Johnstown, Pennsylvania.